The past 10 days have been hectic and yet I have remained the farm almost daily. I have the delightful Alison and Corina that do my domestic duties each Wednesday morning. I am home all day and yet I seem to get nothing done. How can this be? Things changed dramatically on 5 February when I found my 40mg Oxycontin tablets floating in the toilet bowl. I phoned Palliative Care. Dr Newton and the team made the decision that I would be put onto patches; there appeared to be an absorption problem which could have been related to the Dicloxacillian antibiotic that I had been taking for suspected, low grade, chronic cellulitis. The patches went on Saturday. I discontinued taking oral Oxycontin, under medical advice, and the unbearable pain began about 3am Sunday 7th. Being the caring, considerate person that I am I stupidly waited until 9am to phone Palliative Care. I was at screaming point! By 10.30am Sally arrived and promptly gave me an injection (no questions asked.) Miraculously, the pain quickly abated. I went onto the 24 hour pump and remained on it until yesterday when Sally arrived bearing the good news that the pump would be removed. Very nervously, I resumed taking Oxycontin at a higher dosage. It is now 3.49am Friday 19th and I have been wide awake since 2am; not actually in pain, but very unsettled! During this period I have had every test imaginable and the results are 'sort of' in. Dr Gupta phoned Monday with the news that, although the MRI shows a marked improvement in the radiated area, the cancer is still active in the Brachial Plexus. I will learn more when I consult with him this afternoon. Hence the reason for my sleeplessness! The days fly; daily chores take so much longer. Even the simple task of going to the toilet means I struggle to get my underpants and trousers on. I am unable to fasten them. Even when using public toilets, I am sometimes forced to ask for help. Pride has gone out the door and been replaced with humility and gratitude. Daily visits from Palliative Care take anywhere from half an hour to two and one half hours. I still manage to do Haydn's bookwork but I am unsure of the future. I am surprised at the rapid deterioration and loss of function. I am scared, afraid of what is in store. I cry often and laugh lots. I give thanks for my beautiful family and friends that daily express their love and appreciation for having me in their lives. I am isolated at the farm. I am unable to drive and may never do so again. I have lost so much. The isolation that had become my prison is now my bliss. I phoned Lillo and ordered a new computer. I asked for the biggest, brightest coloured notebook; the one that most resembles a desk top. I asked about Web Cam and Voice Activated Technology that will allow me to continue my friendships online. I am planning for the day that I am blessed to have life and yet, the degree of disability will prevent me doing things in the way I have become used to. Today I give thanks for the many blessings that fill my life and the peace that fills my heart. Haydn has always been conscious of preparation and funding his own retirement. As Managing Director of his own small Manufacturing Company, in May 2000 he decided to buy an industrial complex containing 4 sheds, thus preparing for his own his own comfortable retirement. 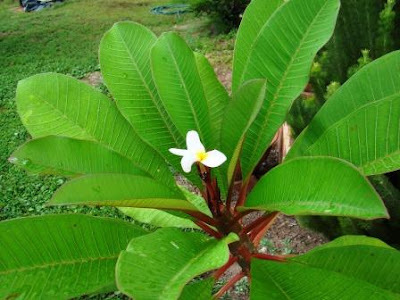 At the time of our retirement - June 2009 - he was given a gift from one of the tenants, 2 very small frangipani trees, which we decided to keep in pots; they were of unknown colour. One of them has just produced its first flower; almost white with pale pink centre. Friday turned out to be drama filled. Palliative care arrived mid morning and set up the canula in the abdomen for the Grasby machine. By mid afternoon, I realised that there was redness at the site. A phone enquiry, regarding the stinging and itching, and was told by Chris they would be right out. Better to do it then rather than drive the distance in the middle of the night if there were problems. They departed about 5.30pm. Around 9pm the alarm began to go off. After waking Haydn to have him unlock the machine ( the lock & key probably insures the safety of the morphine) we determined that it was not the battery. I therefore found myself waiting for a third visit from Palliative Care at 10.23pm Friday night. This time I had successfully pulled the canula out and it had bent back on itself. No way was this little beauty going to give me any pain relief. Thank goodness for the inbuilt safety features of these machines. Then, of course, there was no getting me to sleep. Too much hype for a Friday night. An interesting view of how daggy I looked at that time with the machine hooked up. 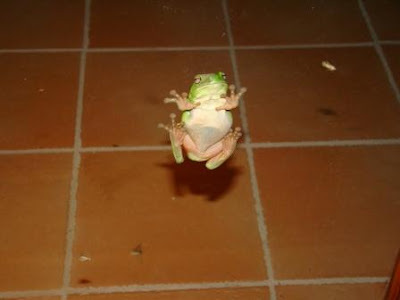 And then there is our big fat night time resident frog. I now know why he is huge! He climbs on our glass French doors later at night and devours the moths and insects that are attracted by the lights inside. I thoroughlly enjoyed my observations. Photography not brilliant as I am learning to manage with a greater degree of disability due to the recurrence of the cancer. Almost impossible to click the shutter with the right hand. 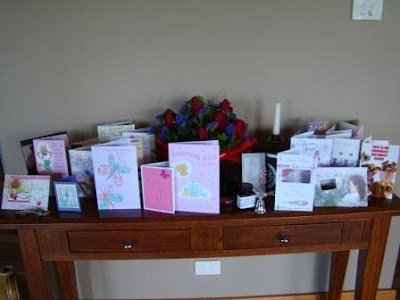 Then there were all of these beautiful Birthday Cards to help me to celebrate my January birthday. Haydn asked if my friends thought I was going to die as there seemed to be more cards than usual. It is between me and my Maker but I know I am not ready yet! 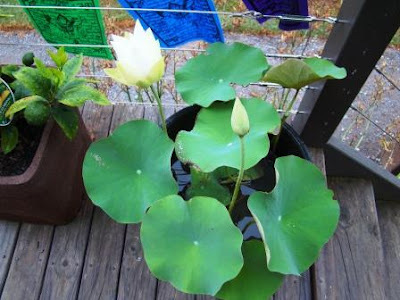 I recently purchased this tulip like lotus plant, aptly named Angel Wings. It has produced its first flower, reminding me that Jeremy is with me in spirit always. The morning began badly. Although the topic of this discussion could be considered a little sensitive, I feel it is imperitive to record the details. One of the side effects of Oxycontin is a tendency to constipation. It seems prudent to check for signs and symptoms after going to the toilet. This morning I was shocked to see, what appeared to be, a 40mg Oxycontin tablet in the toilet bowl. I decided to discuss the matter with the Palliative Care Duty Nurse. Shann listened to my story and suggested that Dr Newton [Palliative Care Doctor] would be the one to ask on her return from rounds. I was told to do nothing and wait for her to get back to me. What a surprise to find not 1, but 4 more tablets in the toilet bowl at lunch time. Panic! Another phone call to Shann and then wait. Not long before I received a message asking if I would have any objection to using patches for pain relief. I said anything is preferable to this unbearable pain. I had no idea how long it had been since the Oxycontin was fully absorbed. It was then I knew that I was being guided. I began to think about the series of events that had led to this. In the past everything was written in my Journal. The return of the cancer in the brachial plexus means that writing is difficult. Almost impossible actually. It was December that I saw Judy Hickey the Physiotherapist at the Mater Hospital. She suggested that I could have chronic, low grade cellulitis which would require a course of a particular antibiotic. She felt the situation was quite urgent. Rather than wait to see my regular GP, she thought it prudent to see Dr Gupta [Radiation Oncologist] as he was somewhere around the hospital. Dr Gupta was busy, consequently I was seen by his Registrar who prescribed a course of Dicloxacillin. It came with a list of possible side effects. I was not surprised to find myself suffering from gut problems. Until today. I began to put pieces of the puzzle together. I realised it was about the same time that the pain returned with a vengeance. I referred to it as acute. My thoughts now are that it was about that time that I stopped absorbing the Oxycontin. I increased my dosage from 20mg morning and night to 50mg three times a day. That was when we began to suspect something sinister hence, the current testing. I once again phoned Shann as I began to think that, if I was right, 50mg patches would be far too strong. After all, maybe it was simply that the 20mg was not being absorbed, rather than a more serious problem. Shann appeared not to understand my concerns and suggested I simply see my GP as soon as possible. 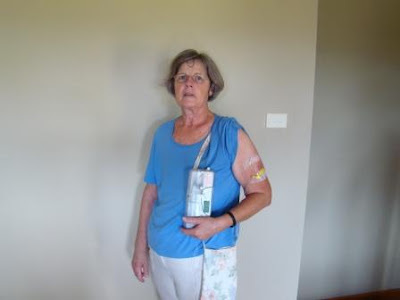 I changed GP's when my GP of 13 years standing told me that this cancer is going to kill me. I decided that I did not want to be treated by a practitioner that had given up HOPE, even if there was a chance that I had lost HOPE. Megs was given the same antibiotic and ended up in hospital. Seems like a check of the stool will determine if I require another course of antibiotics to fix the problem. Left untreated this condition can have dire consequences as nothing is absorbed [including the Oxycontin] Ouch! In the meantime, I will have to discuss the problems with the Pharmacist when I go to pick up the prescription for the patches. Maybe I still require only 20mg of Oxycontin night and morning. My rule is not to worry about how long I live, but to focus on how I live. I intend to stay alive.. no overdose of Oxycontin for me. I feel a definite need to return to these pages and continue my writing as my future is looking just a little uncertain at the moment. A new lump, more in the chest wall than the breast, saw me make an appointment with the Radiation Oncologist rather than the General Practitioner. The decision was made with the knowledge that my GP could not request an MRI should it be necessary, and he would still receive a copy of the Report. Dr Gupta [Radiation Oncologist] instead requested CT and Bone Scans. Although it turned out to be a bad decision on my part, I phoned my GP for the results. I was told that everything appeared to be OK however, he would run it by the Senior Practitioner [Dr Milton Sales] and would get back to me if necessary. I heard nothing; it felt like a welcome reprieve. I was thrilled! Damian and Tyneal had driven almot 1000km from Melbourne to spend a few days. My 12 year old grandson Jascha had been with me for 2 weeks of the school holidays and he would be going home with them. It came as a bit of a surprise to receive a phone call from the Mater Hospital at 3.30pm on Friday 22 January on to say that Dr Gupta wished to see me at 3.30pm on Friday 29th. A week is a long time in the life of an oncology patient waiting on results of imaging! I must admit that I was probably more concerned that I had been kept waiting a week for the results than the results themselves. I was therefore a bit taken aback to see very clearly that there was, what appeared to be, a new soft tissue deposit in the area. It was not surprising to find that Dr Gupta recommended MRI's of both Brachial Plexus and Cervical Spine. He also suggested a PET Scan. I asked for copies of the Reports and headed home to reflect on my diagnosis. Poor Haydn stays strong with all of this and continues to be an amazing support, although I think that he really feels that everything will be OK.
From where I sit now it seems hard to believe that the GP could have thought there was nothing of significance. It certainly does not feel like that to me. Then of course there is the fact that there was a message on our answering machine from Hunter Imaging stating that they had rescheduled appointments to treat my case as urgent. Today there was another phone call from the Mater saying that Dr Gupta wanted me to see Dr Tony Bonaventura [Medical Oncologist] on 26th February. Although I have not had chemotherapy, I had been seen by Dr Gupta's wife who is now on Maternity leave. I am happy with his choice as one of my friends from Group 33 [Breast Cancer Support Group] is a patient and she speaks very highly of him. It would seem that I have achieved nothing by going through intensive radiotherapy. I am still on Oxycontin, although now it is three times per day, rather than twice. The pain is, at times, unbearable and I suffer from lethargy and fatigue and can no longer manage to run a household.